Over the next hour, the crux of the narrative is taken over by Palin's Alaska backers, with former spokesperson Meg Stapleton and attorney Tom Van Flein leading the charge. Other more unfamiliar faces who uphold Palin's Alaska legacy include former Wasilla Deputy Mayor Judy Patrick, former gas pipeline adviser Marty Rutherford, longtime confidantes Kristan Cole and Judy Patrick, and former state Sen. Gene Therriault -- one of the few Alaska legislators who has remained vocal and consistent in his praise of Palin. The recounting of Palin's earliest years in public office relies on a treasure trove of rare and never-before-seen video obtained by Bannon, including shots of Palin breaking ground on a construction project with her fellow Wasilla City Councilors, waving signs for her mayoral reelection campaign, and reacting acidly to a comment made by John Stein -- her predecessor in the mayor's office and one of the film's villains, who compared her to a "Spice Girl." As the documentary transitions to Palin's ascent to statewide office, it dramatizes the culture of corruption that permeated Alaska, with images of fat men smoking cigars in dark rooms and the infamous Suite 604 at the Baranof Hotel in Juneau, where the FBI secretly videotaped executives of the oil services company VECO in a corruption scandal that would shake the foundations of Alaska government just as Palin was making a name for herself as an ethics crusader. "The Undefeated" conveys the dramatic extent to which Palin's world has changed in just a few years, as it shows her announcing her gubernatorial campaign not at a massive rally but at a sparsely attended press conference in her kitchen. Those unfamiliar with Palin's political background will be surprised to learn that the woman who has become one of the nation's most boisterous press critics was once such a media darling that two of the Alaska TV news correspondents whose highly favorable reports are shown in the film ended up leaving their jobs to join the Palin administration. Palin's charisma has in recent years often been overshadowed by the more unforgiving side of her personality, but one scene from the film illustrates how she has long used her personal charm to disarm and discombobulate her competitors. "Oh, this will be fun," Palin says to her soon-to-be vanquished Democratic gubernatorial opponent, Tony Knowles, during a brief encounter in Anchorage on primary night in 2006. Knowles remains speechless, while Palin smiles and adds an "Oh, golly" for good measure. Palin's stint as a hard-charging reformer in Juneau won her approval ratings that consistently topped 80 percent and made her the most popular governor in America, catching the eye of the McCain campaign. It was the "maverick" label that piqued McCain's interest in 2008 -- far more than Palin's supposed purity on social issues -- just as it does the filmmaker's. The movie focuses on Palin's triumphs on fiscal and energy matters, while ignoring hot-button topics like abortion. Indeed, although she was always identified as a staunch social conservative, Palin often worked more closely with Democrats than Republicans in Juneau and largely avoided ideological fights during her first two years in office. Yet Palin the Fighter is an ever-present theme in the documentary; one of its most memorable moments occurs when Meg Stapleton recalls an encounter at the Fairbanks airport when Palin literally stared down an oil executive who told her, "You don't know who you're messing with." The film's third act puts a positive spin on Palin's 2008 vice presidential run, reminding viewers of her initially valuable impact on the McCain campaign by showing the Gallup poll trend lines that had the Republican ticket taking its first lead over the Democrats before the collapse of Lehman Brothers on Sept. 15. It also gives an extended treatment to Palin's speech at the Republican National Convention in St. Paul, Minn., her finest hour politically. "The Undefeated" eschews less flattering topics, such as the Troopergate saga -- which had little effect on the VP campaign but left a lastingly negative impression of Palin in the eyes of many Alaskans -- and her unimpressive series of interviews with Katie Couric. Bannon dramatizes the theme of Palin's persecution at the hands of her enemies in the media and both political parties, a notion the former governor has long embraced. Images of lions killing a zebra and a dead medieval soldier with an arrow sticking in his back dramatize the ethics complaints filed by obscure Alaskan citizens, which Palin has cited as the primary reason for her sudden resignation in July of 2009. The film's coda is introduced with an on-screen caption that reads, "From here, I can see November." It is here that Mark Levin alludes to Ronald Reagan as a Palin-like insurgent who was also once distrusted by the GOP establishment. Palin is then shown firing up a rally that occurred just last month on the steps of the state capitol in Wisconsin. "What we need is for you to stand up, GOP, and fight," Palin, in vintage campaign form, shouts to the crowd. "Maybe I should ask some of the Badger women's hockey team -- those champions -- maybe I should ask them if we should be suggesting to GOP leaders they need to learn how to fight like a girl!" Following an extended in-your-face riff by Andrew Breitbart in which he repeatedly denounces as "eunuchs" the male Republican leaders who decline to defend Palin, the film ends with one last scene from the April rally in Madison: "Mr. President, game on!" Palin shouts before a martial drumbeat ushers in a closing quotation by Thomas Paine, which also appeared in "Going Rogue." The implication is neither subtle nor easy to dismiss. In a telling sign of how the film's message has already resonated with her own thought process, Palin made reference to the Paine quotation during an appearance on Greta Van Susteren's Fox News show last week shortly after she viewed a rough cut of the film for the first time. "It's like Thomas Paine said, Greta, one of our founders. He said, ‘If there be trouble, let it be in my day that my child may have peace,'" Palin said. "I think of that when I consider whether running for office or not." 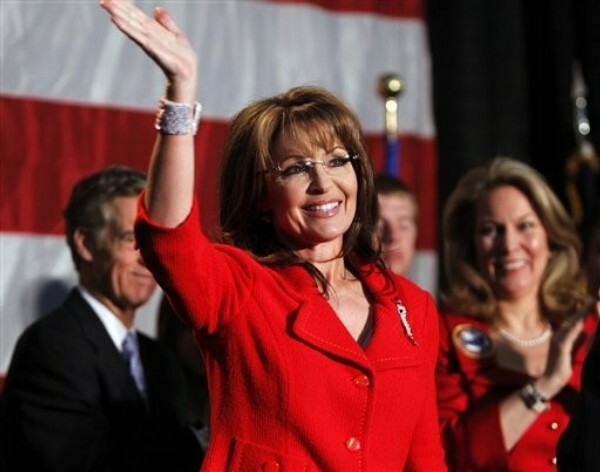 SarahPAC's treasurer Tim Crawford confirmed that "The Undefeated" was a hit with Palin. "The governor thought it was great," Crawford said. Bannon's film also resonated with members of Palin's staff, including Mansour. "I'm a huge fan of Steve's work," Mansour said in a statement to RCP on Tuesday. "His film on President Reagan, ‘In the Face of Evil,' is my favorite documentary, and his ‘Generation Zero' was a rallying cry for the Tea Party movement early on. I think his new film really captures the essence of Governor Palin's stewardship of Alaska, and I think people will be really surprised by it. It shatters so many false stereotypes because it shows what she actually accomplished as governor. You can't leave it thinking the same way about Sarah Palin."